Friday my parents stopped by for lunch. I decided to make calzones. My parents called as they were leaving the house, giving me plenty of time to have a hot meal waiting for them when they arrived. First, I cut my finger chopping the spinach. Then, the kitchen started filling up with smoke. I wasn’t even cooking yet—just pre-heating. Apparently something had dripped in our oven the last time we used it (and we do use it fairly often—thankfully Andy loves to cook). I opened the oven door and more smoke filled the kitchen. I called Andy. No answer. I opened windows. I called my dad. 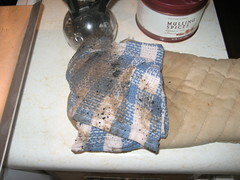 He told me to put on an oven mitt and clean it with a wet towel as carefully as I could. My mom got on and asked if I had a self-cleaning oven. I have no idea if I have a self-cleaning oven. I think, though, having lived in this house for almost fours years, I should know if I have a self-cleaning oven or not. At this point Sophie’s screaming for attention. And the house is freezing. And filled with smoke. 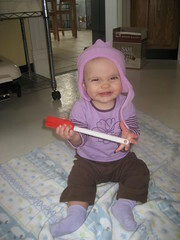 So I gather Sophie up, put her hat on, give her a pastry brush to play with and sit her on the kitchen floor. 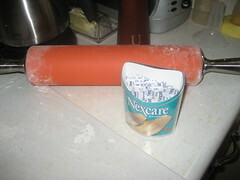 I go back to the recipe. The next step? Brush olive oil on the top of the calzones. I look at Sophie. I look at the recipe. 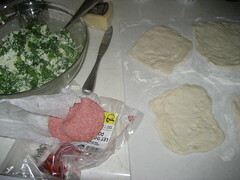 I use my fingers to brush the olive oil on the dough. My parents claimed their calzones were good. I didn’t think mine was all that bad. But Andy, who had his for dinner, could only eat the edges. The middle was a doughy mess. So he had a bowl of cereal instead. 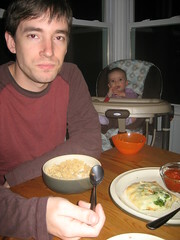 This entry was written by kara, posted on December 17, 2008 at 11:01 pm, filed under Uncategorized. Bookmark the permalink. Follow any comments here with the RSS feed for this post. Post a comment or leave a trackback: Trackback URL.